No tissues needed! Avoid tearing up by rinsing onion under running water to peel, and toss in freezer for 20 minutes before chopping or slicing. 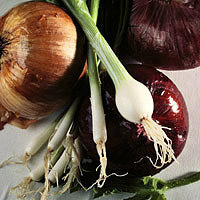 Sweet, red, or green onions are perfect simply raw for salads and sandwiches. Onions are a good source of vitamin C.